It looks like being a mixed bag of weather for Fife this weekend. The latest forecast from the Met Office predicts a cloudy but mainly dry day for the Kingdom on Saturday, with occasional sunny spells and the odd isolated shower. 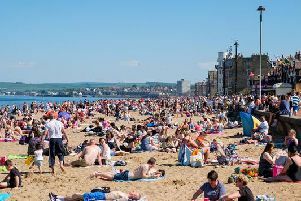 The warm temperatures of late should continue with a maximum of 17 degrees Centigrade, though it will be windy at first. However, things will take a turn late on Saturday night with heavy rain throughout Sunday morning and into the afternoon, before easing off in the evening. Maximum temperature on Sunday will be 15 degrees Centigrade with only slight winds.